If it’s Tuesday, This Must be Belgium. Wolper Pictures 1969. Anyway, the confusion implied by the title has more to do with the speed of the tour than a series of unfortunate events or interpersonal conflict, though I expect both to follow from it. 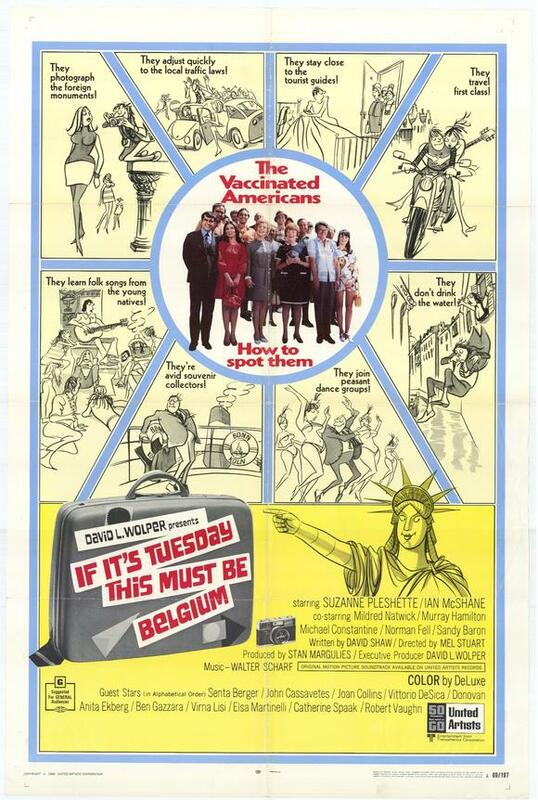 The description focuses on Suzanne Pleshette’s character falling for the tour guide, but I’m hoping the actual story is more ensemble-driven with those two having a small plurality, because the situation seems to lend itself to madcap antics in all directions. World-Wind Tour #225 mixes a large number of American tourists on a nine country, 18-day trip through Europe. Their guide is Charlie Cartwright, a charmer with a girlfriend at every stop on the tour, whose rendezvous keep getting interrupted by tour member Samantha Perkins, a career woman immune to Charlie’s wiles, if not his perseverance. Also on the tour are the teenage girl brought by her parents to separate her from her boyfriend, the WWII vet reliving his tour of duty, and the middle-aged couple arguing over whether they should have stayed home. Not on the tour is Mrs. Blakely, who accidentally gets on the wrong tour bus on the second day, much to Mr. Blakely’s consternation. This was balanced exactly like I expected/hoped. As far as I could tell, everyone on the tour either had their own subplot, or was part of someone else’s. There were two or three main stories, and a few running gags slowly developing on the back burner. Interestingly, my favorite thread wasn’t any of the main plots, but the man who’s just there to steal everything not nailed down (and a few things that are). It starts with the towels you might expect, and grows rapidly ludicrous. It’s quite interesting seeing Ian McShane so young and a tiny bit of a scoundrel. I’m most familiar with his more recent work, which tends toward a large amount of gravitas (or a parody thereof). He’s an entirely different entity here, which is probably what an actor should hope for in a space of forty-five years. This is described as a star-studded cast full of even bigger cameos, but aside from McShane and Pleshette, at this point the only person I recognized is Norman Fell, and he was on the order of “that guy who’s in a lot of things”. Time has eroded the notability of this cast, and that’s a shame. There’s a very visible tension between feminism and womanizing in Charlie and Sam’s relationship, and I wasn’t sure I was going to like it at first, since she calls him out for not taking no for an answer, and it’s obvious where they’re headed anyway. However, part of the process is Charlie losing his rougher edges, and they end up in a place that I think is almost a good example for the modern day. Similarly, the teenage romance ends in a place I’m not entirely sure how to feel about, only that it’s probably more realistic than romantic. This movie is first and foremost, very funny. I think it manages to skewer a lot of culture clash and tourism glut, and it feels very much like I imagine actually taking a vacation in another part of the world. Though I might feel rushed to take in nine countries in eighteen weeks, it often seems to have more breathing room in those 18 days than it ought to, even though it occasionally muses about how overscheduled it is. However, that extra room allows the movie to show off more European travel, so it’s added value. This movie is like being shown vacation slides by a comedian, who wouldn’t enjoy it?